You have a cougar in your neighborhood! There’s a coyote in your field! What to do? On Tuesday, April 16th at 7 PM, Christopher Yee from the Oregon Department of Fish and Wildlife will speak at the Fern Ridge Library, 88026 Territorial Road in Veneta. He will discuss what you should know about living with cougars and coyotes. You have legal rights and responsibilities, but you also need to know your limitations and options. In addition to giving accurate information about the biology of these majestic animals, Christopher will discuss their natural habitats and why they are interested in yours. Christopher Yee has worked as a Wildlife Biologist for 29 years. His career has included work in wildlife research, population management, native habitat restoration, and habitat management for various employers across the United States. Christopher holds a B.S. in Wildlife Biology with a minor in Botany from the University of Montana and a research‑based M.S.in Range and Wildlife Sciences from the Caesar Kleberg Wildlife Research Institute at Texas A&M. This free program is sponsored by the Friends of the Fern Ridge Library. ​In his third book, Children of Death, critically-acclaimed award-winning author Robert Leo Heilman pursues three unanswered questions from his childhood. Growing up in a family in which his German-speaking grandparents had migrated to the United States from Russia during the first decade of the Twentieth Century he found himself wondering: Where had the Heilmans lived before they migrated to Russia? Why did they leave their home to settle there? And, most poignantly, what happened to the relatives who stayed behind in Russia? Here, in this book-length meditation, he takes us along on his journeys retracing the migrations of his family from Alsace, France to Russia in 1810 and on to Kazakhstan and the American Midwest. Along the way he brings us a history of the times and of the fates of a farming family in search of land, freedom and security through troubled times ranging from the Reign of Terror in eighteenth century France, the Russian Revolution, Stalin's purges and World War II. The effects of his German-Russian ethnic group's migrations still linger today sparking controversy in modern day Germany. 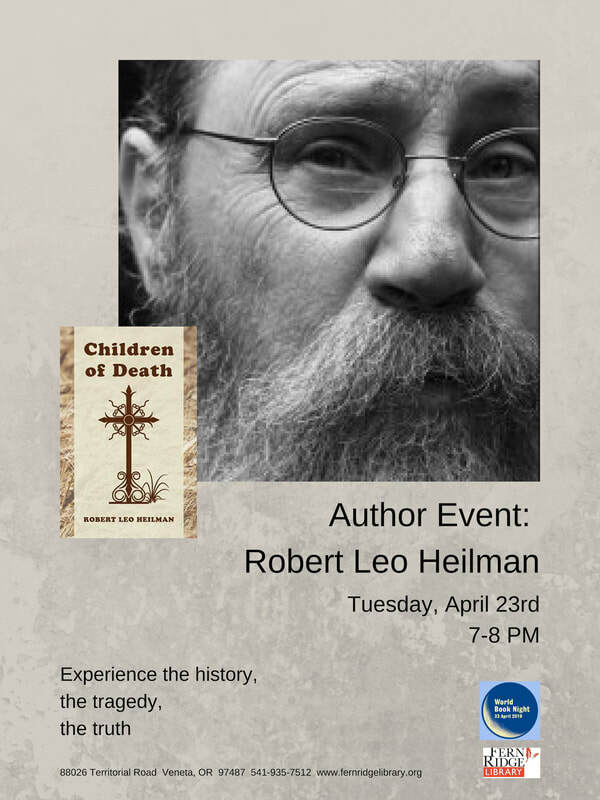 ​Robert Heilman reads from his book and answers questions on Tuesday, April 23rd at 7 PM. The book is available for checkout from the library, and also will be available for purchase and signing on the night of the event. All are welcome. Free. Each poet gets three minutes (plus a ten-second grace period) to read one poem. The highest scores will advance to the next round. All forms of poetry are welcome. Although this is an event for adults and mature teens – please remember that children may be present. Be kind and have fun!